Wherever I go, when locals tell me about an attraction or landmark that isn’t in my guidebooks, I fill up with frenzied excitement, and an intense urge to get there. 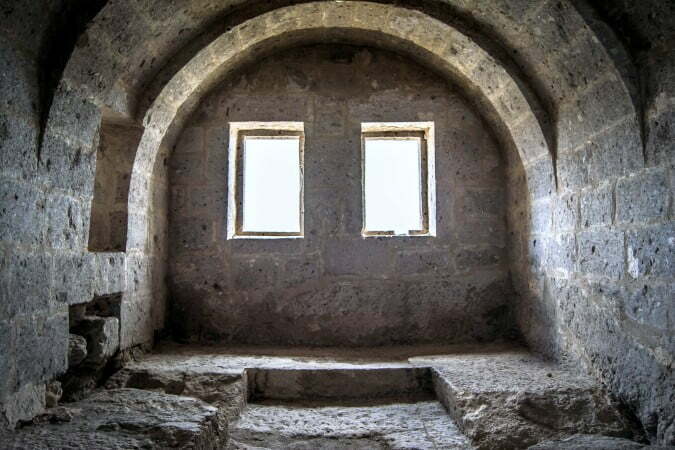 That was my initial feeling when I found out about Yüksek Monastery and Church. 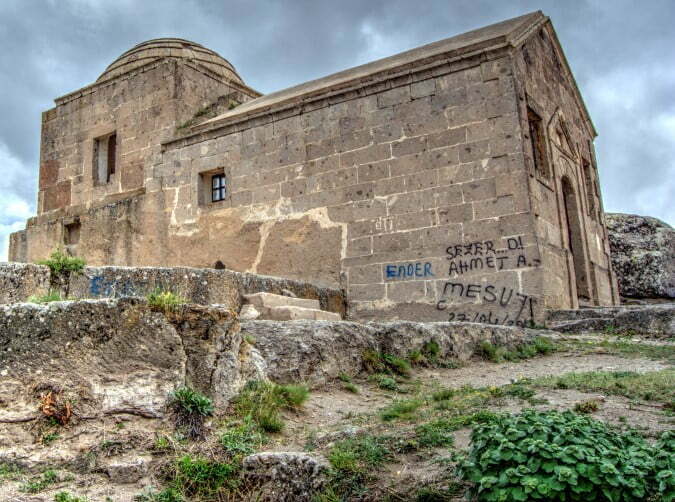 On this occasion, my private guide and driver was taking me to the small district of Güzelyurt in the Cappadocia region. 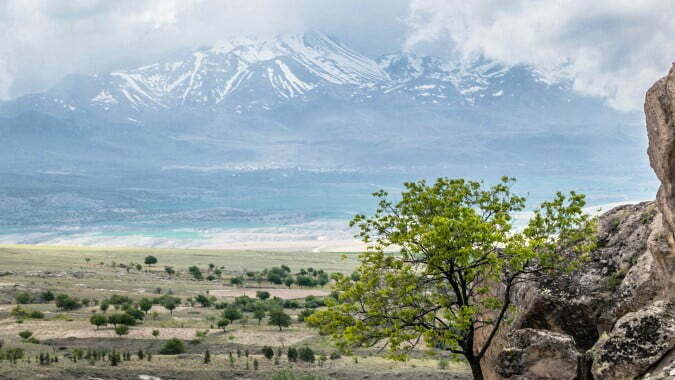 I’d wanted to see it for a long time because out of all the villages in the area, the Greek history of Güzelyurt is said to be one of the best. It was a long drive but thankfully my guide, Cansu was full of local knowledge and his interesting historical facts kept my mind occupied. Plus, it was still Spring so the flat fields of the Cappadocia plains were a colourful sight backed by a dominant view of Mount Hassan. 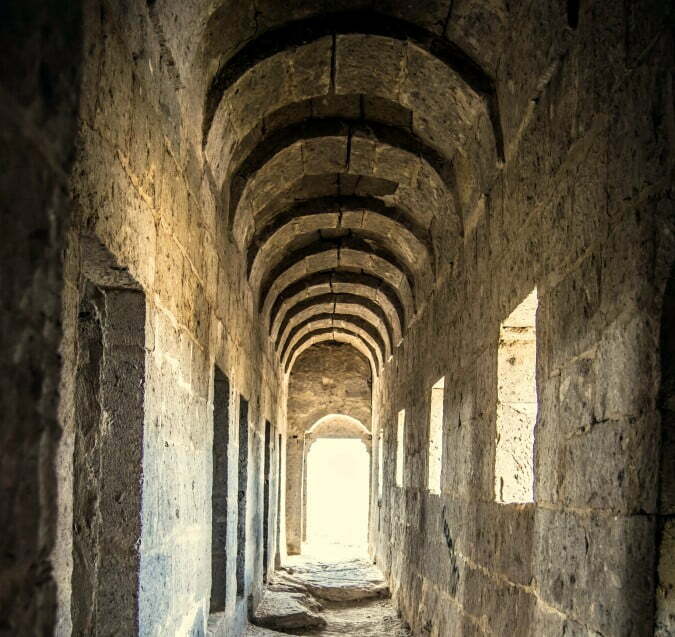 All of a sudden, Cansu braked, pulled up at the side of the road and reversed back to a narrow, rocky path that upon first impressions would lead nowhere. He said there was a small old church here that I might like to see, and as we travelled down the path, a lake, and large rock face came into sight. At the top were the ruins of a small building. Called Yüksek in Turkish (means high), its proper name was Analipsis from the time of its construction by the Greeks in 1894. 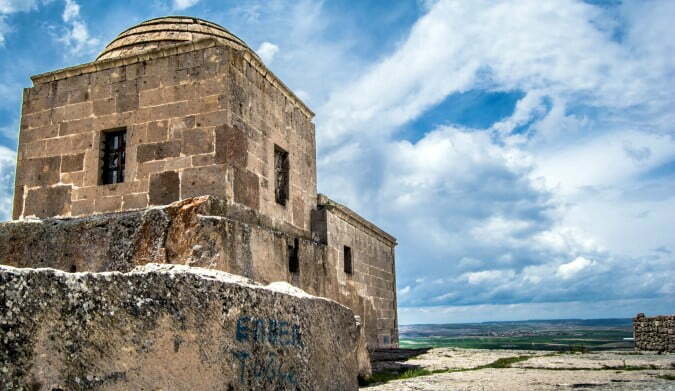 It had a perfect view over the manmade Gelveri Lake, which was also the name of the town when Greeks still lived here. They all left in 1924 after the Treaty of Lausanne forced their deportation back to the homeland and vice versa with the Turks. Apparently, many descendants of those deported Greeks still come back yearly to the Güzelyurt district. I wonder what they would think of their monastery if they ventured in this direction and saw the childish graffiti covereing the interior of the church. It meant nothing at all, apart from an inscribed signature to say that someone had been there. 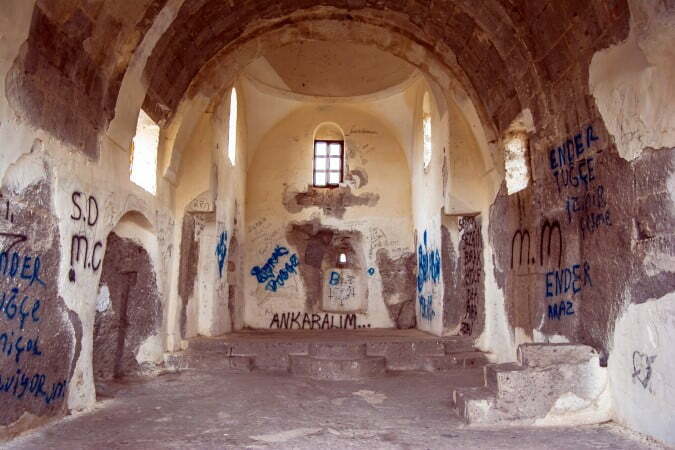 It was a shame, but I’ve seen the same in other historic buildings throughout Turkey. It is general ignorance and a lack of education and interest in historic preservation. Away from the entrance, grooves in both walls indicated where the now non-existent wooden separation panel separated the nave and congregation from the preaching stand. 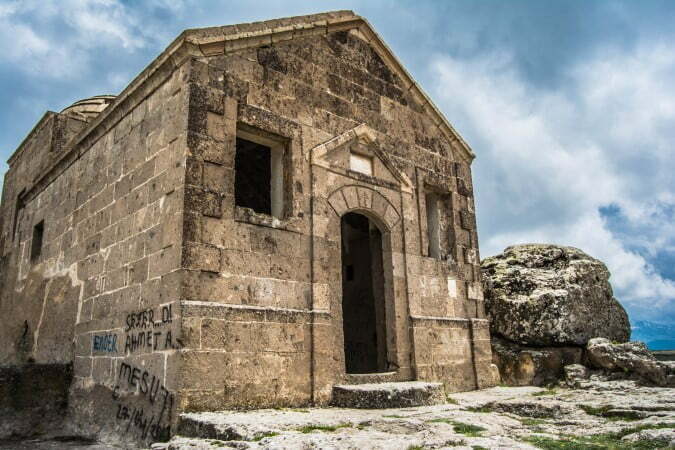 Unlike grand churches of the European world and Constantinople, this was a simple building, ideally suited to monks on a life-long quest for divine grace and identity, but I wonder if they took their simplicity to the extreme. To the right of the church was another small complex that was the monks housing quarters. Rather than call the sleeping quarters, bedrooms, I refer to them as cells because they were just four stark and dreary walls. At the end near the window was a raised stone platform and obviously the monks would have had their own handmade pillows and blankets, but it just resembled the inside of a prison cell. Trying to imagine anyone living in that dreary building in the middle of nowhere made me feel uncomfortable. I hoped they really did have a genuine belief in a higher power because if that had been my life, I would have been as miserable as hell. The uneasy feeling continued. I felt like a stranger without an invite in someone else’s house. So I quickly made my way down the narrow corridor to the exit and climbed over the wall of the compound to try and walk as far around it as possible. That is when I lost interest in the monastery and church because right in front of me was a stunningly beautiful view of Mount Hassan fronted by flat landscapes of greenery. Maybe that is why the monks preferred this destination. Maybe the majestic view of the mountain brought them closer to their god. For me, though, it was just about beauty. Natural, stunning beauty and nothing else. Usually, I try to avoid cliches, but my only words were wow, again and again. I left shortly after that, and while I would go back to see the view of Mount Hassan, I don’t want to see that dreary and depressing monastery complex again. 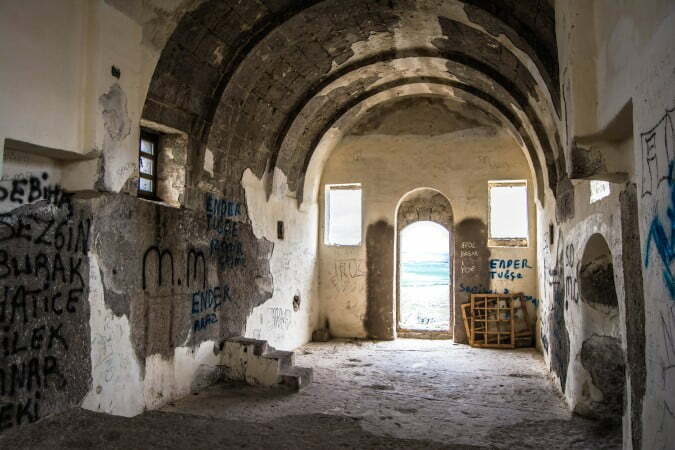 However should any Hollywood movie director search for a post-apocalypse movie setting, the Yüksek Church and Monastery of Güzelyurt would be perfect. Although apocalypse generally refers to the end of the world, its literal and religious meaning is unveiling or revealing of secrets, and that monastery, I am sure has many secrets that need to be told. another interesting post Nat! Loved the view from the verandah. Haunting. Eerie. Loved this piece.